Valentine’s Day is right around the corner, and, instead of running out and spending a wad on stuff, I wanted to put together something tasty and easy to share with my loved ones. I don’t know about you, but Valentine’s Day screams of chocolate, so chocolate it must be. I wasn’t in the mood for putting together anything too challenging (I’m still pretty lazy since getting back from our vacation), so decided to keep it simple. Chocolate cream cheese refrigerator cookies. This is a tasty and easy recipe, which makes a big pile of cookies. You could even make a double batch and have enough to give to friends, family, teachers, and neighbors. Add white or semi-sweet chocolate chips for some extra love or toss in a sprinkling of pecans or walnuts. I didn’t have any of those yummies in the house, so simply chocolate cream cheese cookies it was. Make sure to set aside some time when doing this recipe. The cookies need a bit of time to set up in the fridge, and you could totally go all fancy and use a cute cookie cutter to perfectly shape your sliced cookies. Or you can just slice away like I did. Start by smoothing together the butter and sugars along with the dash of salt. Once it’s all soft and mixed nicely, go ahead and stir in the egg and vanilla. Now slowly add the cocoa and flour while gently stirring. Go slow otherwise you’ll have a huge cocoa flour mess! Sprinkle in the baking soda and keep mixing until the cookie batter comes together. Cube up the cream cheese and add to the mixture. Fold together just until the cream cheese starts blending in with the cookie dough. You still want there to be nice chunks of cream cheese spattered throughout the mix. Tear off a nice length of plastic wrap and drop in your dough. Wrap it up while rolling and lengthening the cookie dough into a long roll, about 1-foot in length and three to four inches in circumference. Place your cookie log onto a sheet pan and then into the fridge to chill for at least two-hours. If you can let it hang out over night, even better. 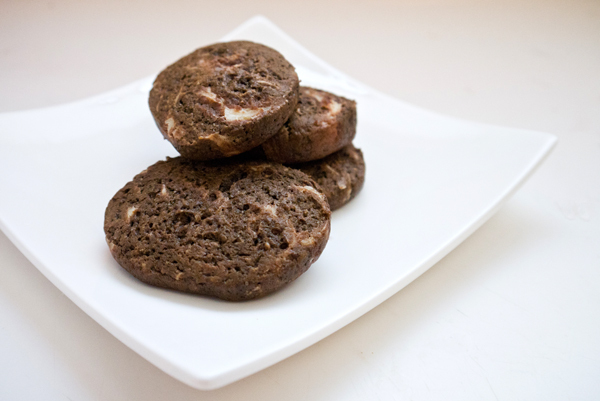 Preheat your oven to 350 F and get out your chocolate cream cheese cookie dough. Release from the plastic wrap and then carefully cut 1/4 -1/2 inch slices and place on a lightly greased sheet pan leaving an inch or so around cookies. Pop into the hot oven for about 10-12 minutes or until the cookie tops are cracked and crisp.